Laboratory manuals were carefully developed to support the hands-on laboratory segment of the Barcoding Life's Matrix curriculum. 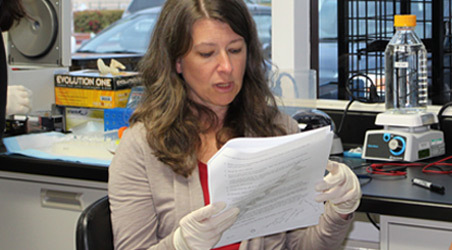 Student and instructor versions of the manual contain detailed scientific protocols to effectively guide students through each step of the DNA barcoding pipeline in the high school science lab. Instructor versions contain additional information including an introductory section, management notes, planning and aliquoting guides, and other information to help maximize student success. The laboratory manuals were specifically designed for use in conjunction with the multimedia presentations developed for the Barcoding Life’s Matrix program. Lab manuals undergo revisions/updates based on collective teacher feedback at the conclusion of each academic calendar year. All manuals are now accessible through the <Teach> tab of the Education and Barcode of Life (eBOL) Community Web Portal. This continually evolving resource is designed to provide a wealth of supplemental material to assist teachers in their implementation of the Barcoding Life’s Matrix curriculum. ALL of these materials were designed by teachers for teachers. Our project coordinator will periodically update these resources based on teacher feedback. The date of last update is clearly displayed at the top of the resource page. Active project participants are encouraged to submit suggestions for additional content to our Project Coordinator.